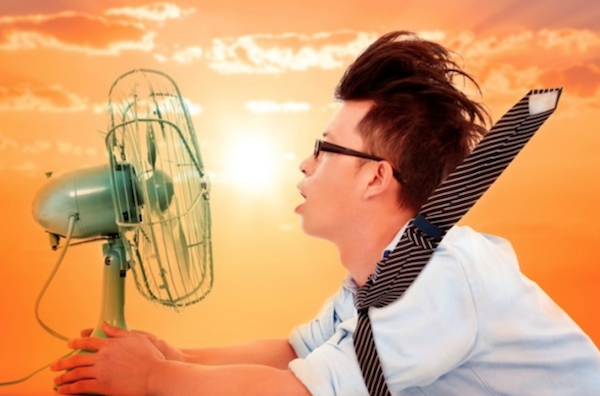 When the oppressive summer heat zaps your energy and turns you into a puddle of sweat, you might be tempted to turn the nearest air-conditioner on to full blast. But constantly running the AC costs money, uses energy, and can hurt the environment. If you don't have an air conditioner, or simply want to save money or be more environmentally friendly, here are seven ways to beat the heat this summer-no central air required. If you don't have access to an ocean, lake, or pool, the easiest way to beat the heat is to take a cold shower or bath. As the cold water hits your skin, you'll feel immediate relief from the heat (bonus: cold showers have been linked to numerous health benefits, including reduced inflammation and improvements in mood). For an even faster way to cool down, put an ice pack or cold washcloth on your wrists, neck, and other pulse points, or put your feet in a bucket of cold water. To get cool without AC, you'll want to open your windows at night (when the outside temperature is colder than the temperature inside), and close them in the morning (before the temperature starts to rise). If you have two windows across from each other, open them both in the evening to create a cross breeze. And if you have a few fans, point one out the window to get rid of the hot air inside, and point another one away from the window to bring cool air inside. A heat wave is definitely not the best time to be roasting vegetables or broiling pork chops in your oven. To keep the temperature in your kitchen (and entire living space) cooler, avoid cooking food in the oven or on the stove. Eat cold foods, such as salad, raw veggies, fruit, yogurt, and ice cream, or cook hot foods on an outdoor grill. Because falling asleep in a sweltering room can be difficult, make some changes to your bedding to beat the summer heat. Natural fibers like cotton and linen are more breathable than synthetic fibers. Placing a bamboo mat on top of your mattress can also help keep your bed cooler (the mat will absorb moisture, and its slats allow air to circulate effectively). If you wake up sweating in the middle of a hot night, try putting your pillowcase in the freezer for a few minutes. The cold fabric on your neck and face will lower your body temperature and help you fall back asleep. Whether you purchase commercial facial spray bottles or make your own, misting yourself with cold (or even room temperature) water can instantly cool you off through a method known as evaporative cooling. This is similar to what happens when you sweat; as the water droplets evaporate from your skin, they take some of your body heat with them, helping you to chill out. Your choice of summer clothing can make a big difference to your internal thermostat. Wear lightweight, loose clothing made of natural fibers like cotton and linen. And opt for white and light colors over dark clothing-dark colors absorb more light, and thus emit more heat. And if you're in your own home-and your roommates or loved ones don't mind-less is more when it comes to staying cool. Staying cool in the summer is not always easy, but saving money on car insurance can be! Get a fast, free quote online, and find out how much you could save.